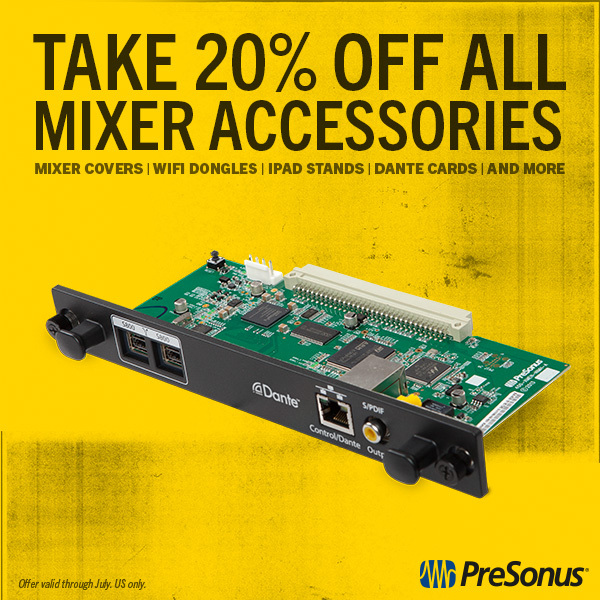 For July 2016 only, we’re offering 20% off of some accessories our online store over at shop.presonus.com, including Dante Cards! This sale includes everything in the “Mixer Accessories” category. Dust covers, headphones, power cables, WiFi dongles, iPad stands, the PRM-1 Measurement Mic and more are all receiving significant markdowns on their already-low prices. And while these are good deals all around, the real stars of the show may be the Dante and AVB cards, which offer savings of up to $120! Curious about adding Dante or AVB to your StudioLive AI Console mixer but not sure why you need to make the switch? Read on. The SL-Dante-MIX option card enables any StudioLive AI-series or StudioLive RM-series mixer to join a standard Dante network. The card houses two Ethernet connections for redundant Dante audio networking, recording and remote control via UC Surface. Next, the I/O consists of one S/PDIF output, and two FireWire 800 connections for continuously bi-directional recording and playback. Finally, you can create a complete, networked audio system using a standard gigabit Ethernet switch and Audinate’s Dante digital-media networking technology. Also, you get no-hassle, true plug-and-play digital audio networking. The PreSonus SL-AVB-MIX AVB option card for StudioLive AI mixers lets you connect your AI console to an RM AI rackmount mixer for rock-solid, low-latency audio networking and control. Tweak the onstage RM mixer’s XMAX mic pres directly from FoH. All StudioLive RM mixers include the AVB card, and a simple firmware update turns on this cool feature. Tired of lugging around heavy reels of copper snake? Know that audio networking is the easy, cost-effective way to connect your audio gear. Also, compared with other networked stage boxes, the RM mixer expands your mix system, giving you a dedicated monitor mixer complete with its own Fat Channel processing and effects, independent of what you’re using at front of house. Finally shed the snake with the PreSonus SL-AVB-MIX AVB option card. In this video we’ll explain some of the basics you’ll need to know about networking for the StudioLive AI Console and StudioLive RM Rackmount mixing systems. You’ll hear about switches and routers while learning what a DHCP server does. We’ll also explain what an IP Address mode is and the differences between the modes supported by the StudioLive AI and RM mixers. In this video we’ll explain some of the basics you’ll need to know about networking for the StudioLive AI and RM mixing systems. You’ll hear about switches and routers while learning what a DHCP server does. We’ll also explain what an IP Address mode is and the differences between the modes supported by the StudioLive AI and RM mixers. For a list of currently approved AVB switches, click here. For more on StudioLive AI Console mixers, click here. For more on StudioLive RM rackmount mixers, click here. The SL-AVB-MIX card for StudioLive AI console mixers is coming soon! This will allow you to connect a StudioLive AI console mixer at front of house to a StudioLive RM rackmount mixer onstage, allowing you to use it as a stage box—eliminating the need for an obnoxious, heavy snake. Ray is happy to show you how to hook it all up, as well as answer some frequently asked questions. And, until April 30—if you buy a StudioLive RM or StudioLive AI mixer, we’ll add the option card FREE! Click here for more details on that. We expect the SL-AVB-MIX card to be available early to mid April, 2015.